As a member of The Association For International Sport for All (TAFISA) and Asian Sport For All Association (ASFAA), Macao Sport Development Board echoes to organize the "World Walking Day"activity every year. In addition to the World Walking Day - National Day Fun Run held after the Flag Raising Ceremony in the morning on 1st October of the National Day, this year, on 2nd October, the World Walking Day Fun Hiking activity was specially held on Sunday for the first time. 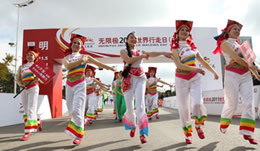 The "World Walking Day - National Day Fun Run" activity was held in the Golden Lotus Square at 8:15 a.m. on 1st October. Due to rainy weather, the arranged walking activity was cancelled, proceeded only with the Fun Run. Mr. Chui Sai On, the Chief Executive of Macao SAR officiated the starting ceremony, and more than 800 participants started off with the blast of the ceremonial canons. Covering a race distance of 3 kilometers, ten awards were classified for the men’s and women’s category respectively. The year's best result in the men's category was 8'31"; while the women's category was 9'35". 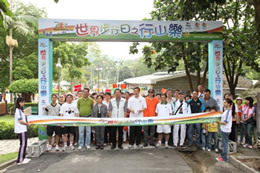 Organized by the Macau Sport Development Board, the "World Walking Day - Fun Hiking" kicked off at the Coloane Seac Pai Van Park at 9:30 a.m. on 2nd October. After the starting ceremony, around 1,200 participants were split to hike out into two routes, namely the red and the blue route. The blue route first passed through the Giant Panda Pavilion to the Seac Pai Van Park, which links to the Coloane hiking trail. The red route started near the Natural and Agrarian Museum, and passed through the Coloane natural pathways to the Coloane walking trail. The two routes converged at the Peak Park where snack supplies were provided for participants, followed by going downhill along the Estrada do Alto de Coloane to the destination at Seac Pai Van Park. Both routes covered an approximate distance of 4 kilometers, which lasted around 90 minutes. The Sports-Health Advisory Station, recreational games and performances were organized at the starting point. The organizer hopes that more residents would adopt life-long participation in sports and persist in daily sport practice towards the ultimate goal of "Sport for All".